Here is an unpeated warehouse edition from Swedish distillery Mackmyra. The Mackmyra Smögenlagret Warehouse Edition was distilled on 2009-01-06, then matured in 200 litre bourbon casks until 2015-06-09. Then the liquid was transferred to 100 litre Swedish oak casks for finishing until it was bottled on 2017-02-14. The total outturn was 665 bottles (50 cl). 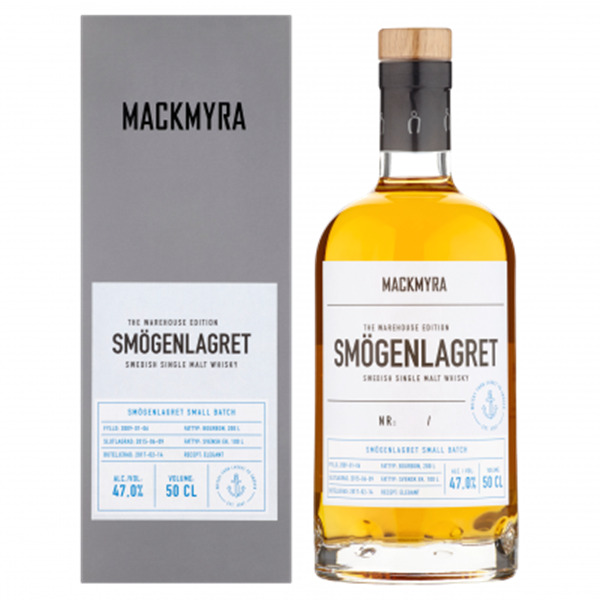 The Mackmyra Smögenlagret Warehouse Edition was available in Sweden only, at SEK 899 (8149402). There appears to be a few bottles left to buy if you go online. Nose: Crisp and clean profile. Vanilla, apples and pears. Fruit drops with a fine coating of icing sugar. Notes of fresh oak. Taste: Medium body. Not all that sweet. Ginger, vanilla and nuts. Some bitterness mixed in. Herbal and slightly green in character. Finish: Medium long finish. More ginger. Fizzy-like mouthfeel now. Still not very sweet, but the sweetness I do find is an oaky kind of sweetness. Ginger, herbs and nuts - with added caramel and chocolate. Comment: Personally I think the Swedish oak finish makes too much of an impression, but it is still a nice enough dram.